When life gets messy, make something saucy. I’m sure someone has that embroidered on a pillow or something like that. If not, they should. Life has been completely crazy lately, but we’ve still been eating well. One of the greatest skills I’ve acquired while teaching myself to cook has been learning to make sauces from scratch. This recipe is a version of one that I made when Michael and I were first married that got me really excited about cooking. Call it a baby-step to the big guns, if you will. (Mother sauces would be the big guns in this instance. A series of posts on that topic is coming soon…) Making a great meal at home with real ingredients doesn’t have to be difficult, fussy, or time-consuming. This dish is a great main course especially when the weather is scorching, since you only need a large skillet and one stove burner. No turning on the oven is a good thing some days. This pork tenderloin is a good thing any day. 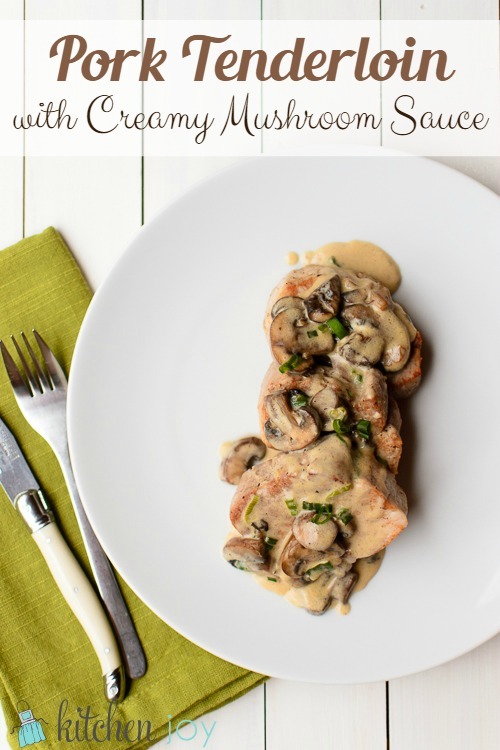 This Pork Tenderloin with Creamy Mushroom Sauce uses sour cream in the sauce to add an extra richness that goes wonderfully with not only the pork, but we have also come to love it with mashed potatoes for an ultimate weeknight dinner. Asparagus would be a great addition to the menu as well. 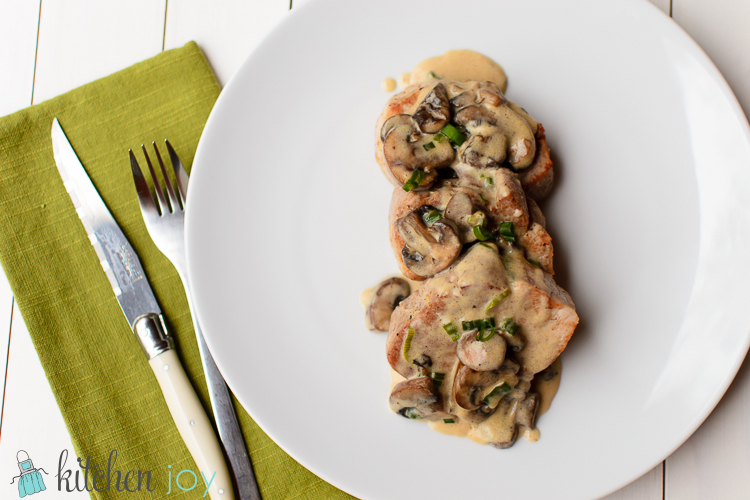 Slice pork tenderloin into 1-inch thick medallions. Season with salt and pepper. Heat 1 tablespoon butter and 1 tablespoon olive oil in a large skillet over medium heat. Add mushrooms and cook until lightly browned, then add green onions and cook for another minute. Transfer cooked mushrooms and green onions to a bowl and set aside. Add remaining butter and olive oil to the skillet set over medium heat. Sear pork medallions until browned on each side. Add wine and 1/2 cup chicken broth and bring to a simmer. Reduce heat to low and cover the skillet. Continue simmering, covered for 15 minutes. Transfer cooked pork to a serving dish and cover to keep warm. Whisk flour into remaining 1/2 cup chicken broth and add to skillet over medium heat. Cook, stirring constantly, until sauce has thickened. Season to taste with salt and pepper. Stir in sour cream, mushrooms, and onions. Serve sauce over pork and garnish with chopped parsley, if desired.